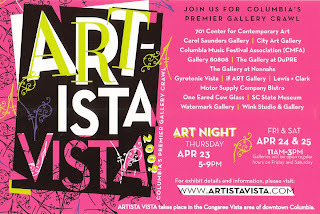 The resident artists at Gallery 80808/Vista Studios will present their spring exhibit for Artista Vista, the annual art gallery crawl through the downtown Columbia Vista neighborhood. 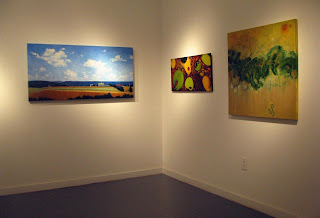 The show, View from the Studios, opens with a reception on Thursday, April, 23, 2009 and continues through May 12, 2009. 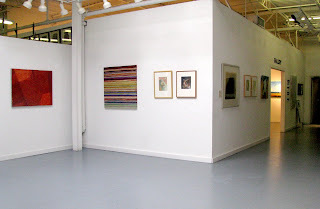 Fiber artist Susan Lenz works in the most central studio, a space with walls that stop short of the ceiling. 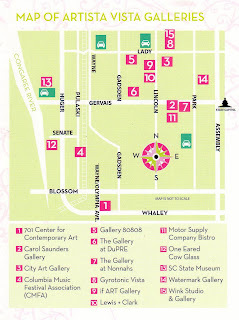 She is at the center of activity and welcomes interaction with chance visitors and fellow artists. And such interaction, listening to the stories of individuals, blossomed into her ongoing Decision Portrait series. Lenz will present more than six new portraits of this series, including: Overcoming Childhood Domestic Abuse, Dealing with Alzheimer’s, Terms of Marriage, and Foreigner. In each Lenz explores a life-altering decision made by the portrait’s sitter. Tuned to the terrain of the Palmetto State, Stephen Chesley coaxes hauntingly familiar landscapes from shadows and suggestions on his paint-washed panels. 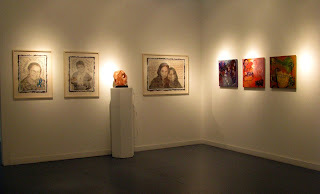 He includes in the exhibition Nightrange, and Lagoon, and Moon, Venus, both oil on masonite. Don Zurlo turned to the perspective of the inner eye to paint the non-objective 032809SFA1, which embodies the colors and textures of a spring morning. Similarly Robert Kennedy dwelt on the shapes and colors of life below the surface to paint Dream Pond. Laura Spong’s painting process is intuitive. She allows her non-objective paintings, once complete, to suggest titles. Spong includes in the exhibition two paintings from decidedly unique perspectives: View from across the Meadow – the sightline of a small creature in the grass of a spring meadow–and View through a Spider’s Eye. Sculptor Pat Gilmartin’s study of nature is evident in her contribution, the slip-cast relief of a heron stalking through marsh grass. Sculptor Sharon Collings Licata journeys within for inspiration and understanding to patiently carve in stone. Her explorations bring the intimate and inviting spirit to Inner Shelter carved in Utah alabaster and Teardrop carved in Colorado alabaster. Pat Callahan looks to the feminine body and archetypal forces for voice in mixed media “muses”, assembled figures the embody feminine essence. 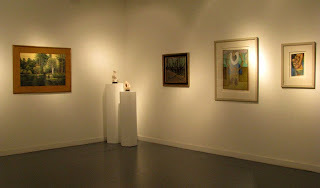 These works may be seen in the exhibition. 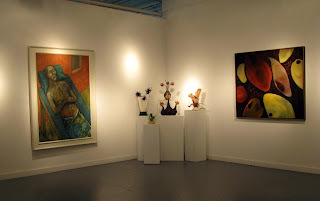 Vista Studio artists Ethel Brody, David Yaghjian, Michel McNinch, and Jeff Donovan will also present new work in “View from the Studios” and open their studios for Artista Vista.